Lights, Camera, Action! Thats right, Photo Booth Express unveiled the brand new “Classic” style photo/video booth. Not only does it take and print the usual fun photo strips but we’ve added the option of video messages too! 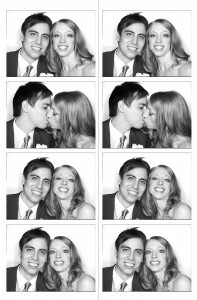 We rolled out the new feature with our friends Michele and Edmund during their reception at The Ivy Room at Tree Studios. The Ivy Room has such a unique layout with multiple levels of service. They have a beautiful outdoor courtyard where you can enjoy the Chicago air, as well as the spacious inside with plenty of room for large and small parties. The reception was packed with friends and family and beautifully done with all the flowers expertly arranged by Botanicals. There was extra time and efforts put in to not only making things look good, but also accenting them with touches of lighting decor. The delicious array of food and cocktails were provided by Boka. DJ Megan from Fig Media kept the party going and all the while guests were lining up to use the photo booth. There was a buzz in the air that evening and it made for an outstanding experience for not only myself, but the entire guest list. We took so many pictures that night and whats even better, most of the guests left a quick message for the newlyweds in the booth. So many nice things were said and Michele and Edmund couldn’t have been happier when they received all the photos and videos of their friends and family leaving them thank you’s, heartfelt words and hilarious advice. We want to congratulate Michele and Edmund again and wish them the best! Also thank you for having us and for trying out our brand new feature. It was definitely a blast. Check availability of a photo booth through our sister company MDM Entertainment by entering your event date below. See more client raves here.